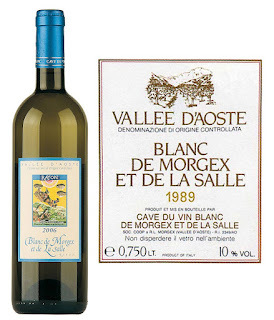 This unique italian wine is produced in the region of Valle d'Aosta, in the high Valdigne area, exclusively in the towns of La Salle and Morgex. It is obtained from the local grape Prié Blanc, which has the particularity of being ungrafted, that is not grafted onto american vine. Normally, indeed, grapes are grafted onto american ones to avoid the attack of a particular pest, the phylloxera, to which conversely the roots of american grape resist. However, this is not necessary in the case of Prié Blanc, since it is grown only between 900 and 1200 meters, thing that made it virtually immune to the parasite attack. The colour of this wine is straw with green reflections. The bouquet is fine and delicate, fruity with mountain herbs and freshly cut hay hint. The taste is dry, very delicate with fruity notes. It has an alcohol content ranging from 11° to 15,5°. Suitable as an aperitif, it goes well with delicate appetizers, fish dish or also with white meat. Excellent with soft cheeses, it should be served at 8°- 10° C. The Blanc de Morgex is also used in the production of a great world champion grappa, and of a typical brandy. If you want to taste this wonderful wine you can also come in the town of Morgex. In the month of July, in fact, the town hosts the famous festival of the trout and Blanc the Morgex. See a video of the event HERE and book your hotel with Leibtour.com.